844 million people don’t have access to clean water. This method, when perfected outside the lab, could help. A team of researchers led by Rahul Nair of the University of Manchester have invented a graphene oxide membrane that can sieve salt from seawater, producing potable water. Graphene has been tipped as a promising material for this kind of purpose for some time, but previous attempts have failed because graphene oxide membranes swell up when submerged. This allows salt particles to flow through, impeding its ability to properly filter the liquid. However, Nair and his team counteracted this problem by building walls of epoxy resin on both sides of the membrane. This offered them close control over the size of the membrane’s pores, which could be made small enough to sieve all the varieties of salt that tend to be present in seawater. Data from a 2017 report by the WHO/UNICEF Joint Monitoring Programme indicates that 844 million people don’t have access to clean water. The graphene oxide sieve could help provide a cheap, quick, and effective way to filter seawater. 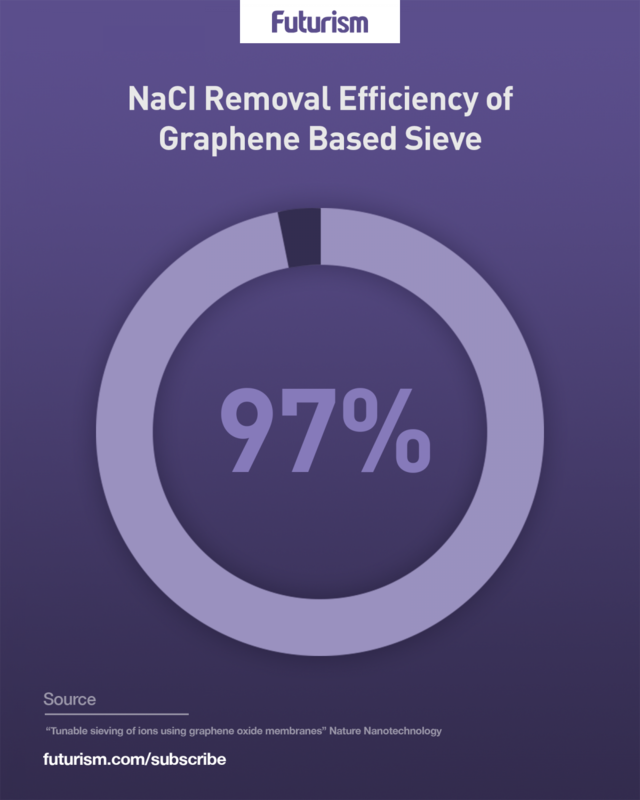 Single-layer graphene is notoriously difficult to mass produce, but since this project uses graphene oxide, the end result should be relatively inexpensive and easy to manufacture. “The ultimate goal is to create a filtration device that will produce potable water from seawater or wastewater with minimal energy input,” said Nair. However, at the moment the concept has only been demonstrated in a lab setting. Additional research is needed to make it a viable real-world option. Scientists all over the world are hard at work searching for and developing better ways to produce clean drinking water, ranging from large-scale implementations of conventional desalination techniques to innovative machines that can turn urine into potable liquid. With sea levels on the rise, and millions of people in dire need of drinking water, devising a method for making seawater drinkable could prove to be an efficient, cost-effective method.